A solar controller is essential to protect your battery! Your Position: > Knowledge >> solar controller >>> A solar controller is essential to protect your battery! When you purchase a solar home installation with battery backup, one of the components you will need to select is a solar Controller. What is this object and why is it necessary? The quality of the solar controller will directly affect the life of the backup batteries. This is due to the particular chemistry involved in the depletion and recharging of the Lead Acid Accumulator batteries. When the battery is depleted of charge, the lead plates inside the battery are corroded. It is this corrosion that provides the electricity. When the battery is recharged, the plates are rebuilt, the opposite of the depleting reaction. Purchasing a good quality solar controller will give you peace of mind and greater savings in the long term. You’ve constructed your magnetic power generator to save big bucks from your electrical utility bill. Now you want to put your system together, sort of like a cash register. Your very fist component you need to acquire is a solar controller. Without this component your system is dead and so are your potential savings. Here I will give you the ins and outs for what you need to know about solar controllers so you can save big on your utility bill while you are generating electricity at home. It’s important to know the proper usage of a solar controller, if you are relying heavily on solar energy in your day-to-day life. PV charge controllers come in all shapes and sizes. Easy to install, a PV solar controller is required in almost every solar power systems that utilize batteries. 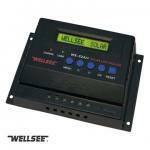 Most solar panel controllers come with either a simple LED or digital displays. These days you will also find these PV controllers with built-in computer interfaces for better monitoring and control. Charge controllers come in all types of sizes, voltages, features, shapes, and price ranges. They range from small 2 amp shunt models all the way up to 80 amp MPPT controllers. The size you need will depend on the design load of your system. In other words, you need to know how much power you plan on using. There are three types of controllers: simple one or two stage control, PWM, and MPPT. The simple controllers are extremely reliable and disconnect the voltage when it reaches a certain level, but you don’t really see them around much anymore. The PWM controllers are what is readily available at the low to medium price range, and is the industry default controller now. The MPPT controllers are the best and most expensive available, and I want to expand on them more here. How the solar controller works? Its primary function is to regulate the power passing from the solar panels to the batteries. They assist in properly maintaining the solar power system batteries by preventing them from being over or under charged, thus offering long life to batteries. The current passing through the solar charge controller charges the batteries used in various household items. This current can also be passed to the invertors for converting direct current (DC) to alternate current (AC). At night or when solar modules aren’t generating any power, power can actually flow backwards from the batteries to the solar modules, draining the batteries. The solar charge regulator would ensure that this doesn’t happen. If solar energy is not actually passing from the solar panels to the circuit, it disconnects the solar panels from the batteries and stops the reverse flow of current. The charge controller regulates the flow of current coming from your magnetic power generator. You are making tons of energy from your magnetic generator and now you need a way to usefully control it. If you are sending too much voltage to your battery bank you can fry your batteries and permanently damage them… ouch! Batteries are expensive so you want to protect them as much as possible. The charge controller works in the same manner as a voltage regulator in your car. Most batteries will need 14 to 16 volts for optimal charging and the controller does this for you automatically. How to find the suitable solar controller? 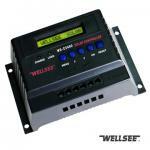 You will find numerous solar controller manufactures, but finding a good quality solar controller. 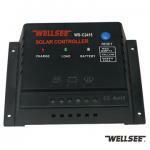 Wellsee solar controller is your first choice! Welcome to contact!